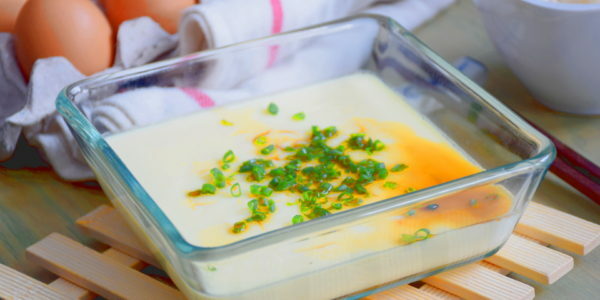 A plate of Chinese Steamed Eggs (蒸水蛋) garnished with chopped spring onions and drizzled with a few drops of light soy sauce is irresistible and can send you halfway to paradise. The truth is that the simple appearance of Chinese steamed eggs is deceiving. It requires a pair of skillful hands to cook up a silky smooth custard with a soft texture that every home cook dreams of. It is easy to learn but difficult to cook perfectly. In this article, I will summarize all the essential techniques you need (Once you get them, they’re super simple) and be able to cook the steamed eggs at home in as short as 15 minutes. Since it is perfectly suitable for the targeted readers of my forthcoming cookbook, I have dug deeper into the details of making the perfect Chinese steamed eggs by referring to the methods perfected by various renowned Chinese chefs. Although there are differences among the methods used by the top chefs, all of them agreed that the perfect steamed egg should look like a piece of silken tofu, the ratio of water to egg must be correct, the heat for steaming must be well controlled, and the cook must master the exact duration. The steamed egg is the greatest when the eggs are just set with a smooth surface, jiggling when you shake them, and as soft as tofu in the middle. To achieve this perfection, you need to put your heart and soul in it, or all your effort will go down the drain due to just a small mistake along the way. Read the expert opinion from a list of the most celebrated Chinese chefs. This is the collective information curated from articles and videos and rewritten in my own words. According to chef Martin, the secret of steaming the perfect egg is the egg to water ratio of 1:2. The eggs are mixed with cooled boiled water or cold stock. The egg mixture should be stirred in one direction to minimize the formation of bubbles. He also stresses that since tap water contains chlorine, it should be boiled and cooled to remove the chlorine before adding to the egg. The heat from the water will coagulate the egg white, and make the steamed eggs look aged, with an unsightly honeycomb-like surface. Therefore, the temperature of the egg and water should be the same for a more homogenous and smooth texture of the steamed egg. Filter the egg mixture through a sieve to remove bubbles and debris before transferring to the steaming dish. 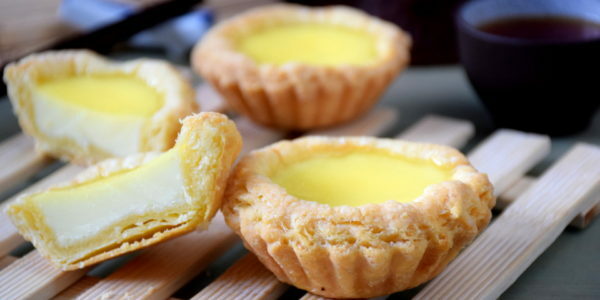 The dish should be large enough to allow the depth of the egg mixture to be 2 cm or less, otherwise the center of the egg custard is at risk of not being thoroughly cooked. The optimum timing for steaming also depends on the steaming dish. Ceramic dish is thicker and needs longer time, whilst metal dish conducts heat efficiently and requires shorter time. Chef Martin uses cling film to cover the dish before steaming to prevent water droplets from dripping on the surface of the egg custard during steaming. 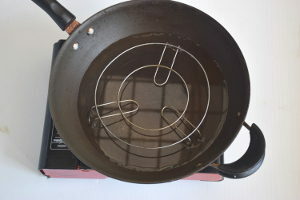 Medium heat is used for steaming the eggs. 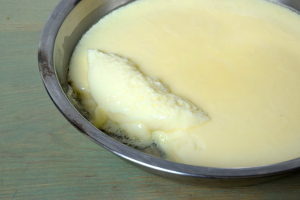 Chef Martin says that if the heat is too strong, once the upper and lower surface of the custard is set, the inner part of the custard will still be raw. Drizzle some light soy sauce, cooking oil and add a dash of white pepper powder to the steamed egg before serving. Former Chief Executive of Hong Kong in 2001. Chef 鍾 suggests adding cooled boiled water to the eggs with an egg to water ratio of 1:1.5 and steaming over high heat for eight minutes. He adds sugar, salt, sesame oil, and pepper powder to the egg mixture. The timing for steaming should be one-minute shorter if the steaming dish is shallow. He says that if you do not have cling film at home, you can steam the egg with the lid on over high heat for one minute, then the lid off to let the steam escape. Continue steaming for four minutes over medium heat to finish it. 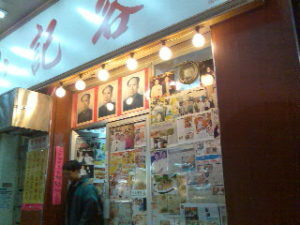 Chef 禤智明 has been with Luk Yu Tea House for over three decades. His say that there is no steamed egg on the menu of the tea house. Steamed egg is an off the cuff request from his regular customers for his secret recipe. The ratio of egg to water for his steamed egg is 1:1. He starts steaming the egg over high heat for five minutes, then takes off the lid to let the steam escape. He then puts the lid on again and steams over low heat for four minutes. He ensures that the lid is tightly closed while steaming. He adds cornstarch and vegetable oil to the egg mixture before steaming. 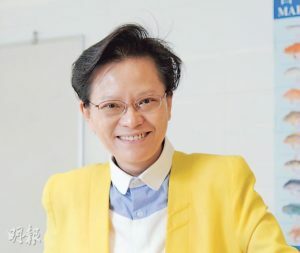 Dr. Fong specializes in food sciences and has carried out an experiment to compare the result of steamed eggs prepared with different egg to water ratios. First she beats the eggs, water, chicken seasoning powder and filters the mixture. Then the eggs are covered with aluminum foil before steaming over low heat for ten minutes. The result shows that the eggs steamed with 1:2 and 1:1 ratios has a very smooth surface. The color of the egg steamed with the 1:2 ratio is lighter, but the texture is smoother. However, the surface of the steamed egg with the 2:1 ratio has aged and forms a honeycomb-like surface. She concludes that the secret of getting a smooth texture is to steam the eggs over low heat. Since the egg protein will transform from liquid to solid state at around 70°C, the texture will become ‘aged’ if the heat is too high. The aluminum foil helps prevent the steam from directly contacting with the surface of the custard, thus preventing the surface from overcooking. She concludes that the 1:1 ratio is best for steamed egg. Chef Yun became an apprentice at the tender age of twelve, and once followed his master to serve as the private chef of the former president of the Philippines, Ferdinand Marcos. 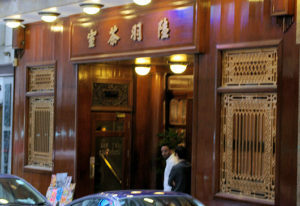 Upon returning to Hong Kong he started his own restaurant Yun Kee and has been awarded Michelin stars in 2009. He uses chicken stock instead of water to prepare steamed eggs. His magical ratio is 1 part of the egg to 1 1/2 parts of chicken stock. Like many other chefs, he beats the eggs in one direction, filters the egg mixture and removes the bubbles with kitchen tissues. He steams the eggs over high heat for 5 minutes with the lid on, then uncovers it to release the steam, then puts the lid on for another three minutes. 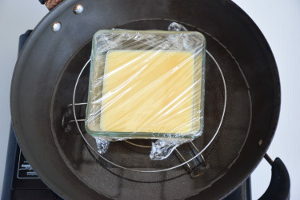 When it is removed from the steamer, the center of the Chinese steamed egg custard still jiggles and will be cooked by the remaining heat within the eggs. How do these expert Chinese steamed eggs secrets measure up in the home kitchen? 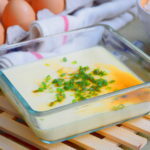 What becomes of the steamed eggs when these tips from renowned chefs are applied in the home kitchen? Cooking is a skill. When someone cooks according to a recipe, the result can be varied from one person to another. In the process of searching for excellent Chinese steamed eggs, I have tried a variety of ways to steam eggs according to these expert opinions. 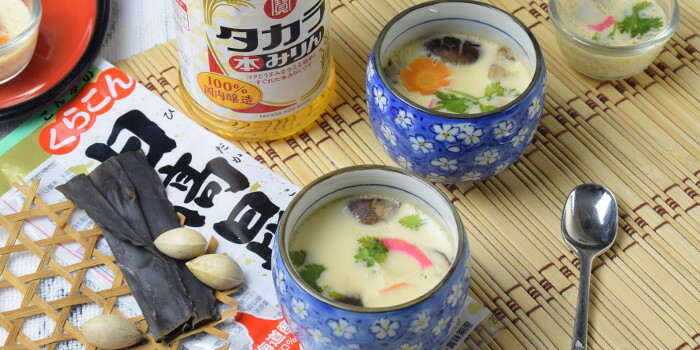 Ratio 1:1 is firm, similar to chawanmushi, but one must take great care because one has a smaller margin of error and custard can become ‘aged’ easily. Ratio 1:1.5 has a very smooth texture and firm middle, which is the best option in my opinion. Ratio 1:2 is a little too soft and can be broken easily when it is scooped from the dish. Both taste identically as a result of a blind test by five people. 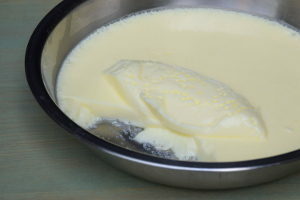 However, it is better to use cooled boiled water for safe consumption because the internal temperature of the custard does not reach 100°C during steaming. This also differs from country to country, as tap water in certain places is not suitable for drinking. Quite acceptable but not as smooth as the one covered with cling film. (bubbles at the edge). 3 eggs (50 g each) are used in both dishes, both are added with 225 ml of cooled boiled water and 1/4 spoon of salt. They are beaten in one direction, filtered before pouring into the steaming dishes, and steamed for 8 minutes over low heat. One is wrapped with cling film and the other one is not. With cling film– the surface is smooth and shiny. When it is scooped out from the dish, the texture resembles a piece of silken tofu. Without cling film– the surface is a rougher, with some holes especially around the edge of the dish. Cling film helps to produce a smoother surface. 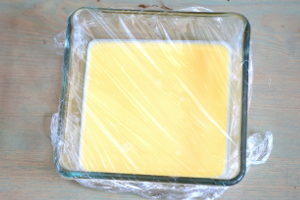 It is possibly due to the cling film preventing the direct heat of the steam from reaching the surface of the custard. Test 4- The effect of steaming the eggs over low heat and high heat initially, uncovered and continued over low heat. High heat 5 min follow by low heat 3 min– the center is still jiggle when shake it. I steamed the eggs for 5 minutes over high heat, opened the lid to let the steam escape and continued for 3 minutes over low heat as practiced by chef 易, the owner of Yun Kee Kitchen. High and then low heat– the inner part is softer than the surface, though it is not very significant. The surface is not as smooth as that of eggs steamed only over low heat. Dr. Fong’s method produces a smoother surface, but the inner part is a little firmer than in chef 易’s method. Verdict: Dr. Fong’s method is the winner because it produces silken smooth results. 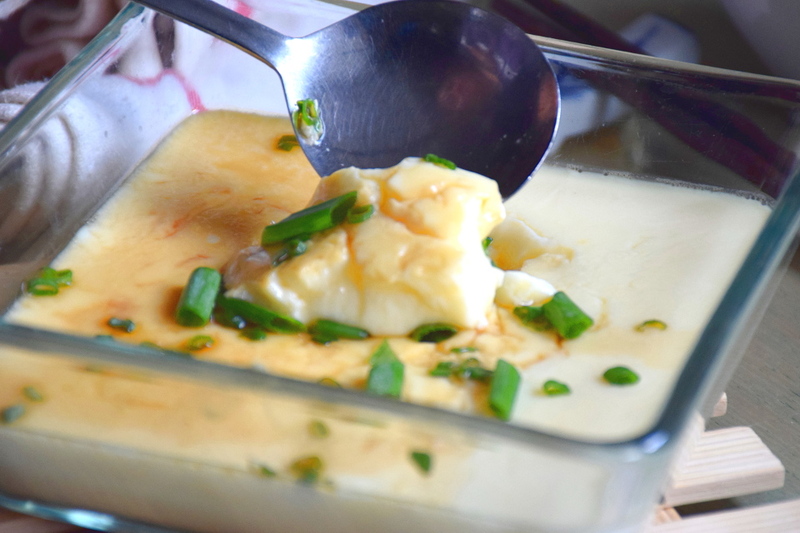 After all the desk research and testing in the kitchen, here is my version of the Chinese steamed eggs. My intention is to include a foolproof recipe in my forthcoming cookbook as I realize may people wants to know how to make egg custard correctly. I have not eaten the Chinese steamed eggs cooked by any of the above-mentioned chefs, but I believe they must all be excellent. Note: The eggs I use in this recipe is at room temperature. I have not tested the additional time required if you use eggs that taken straight from the fridge. Please use eggs at room temperature if you want to follow the timing as stated in this recipe. A very simple egg dish that is cooked by almost every household in China. Beat the eggs in one direction for half a minute. Add the remaining ingredients and beat for another minute. Filter the mixture twice through a sieve to remove impurities and bubbles. Use a spoon to skim any bubbles from the surface. Set up a steaming station. Steam over low heat with the lid on for 8 minutes. Drizzle light soy sauce and sesame oil on top and garnish with chopped spring onions. The eggs I use in this recipe is at room temperature. I have not tested the additional time required if you use eggs that taken straight from the fridge. Please use eggs at room temperature if you want to follow the timing as stated in this recipe. If you do not have digital scales, you can fill up a standard cup for baking purpose plus one tablespoon of water. It will be about 260 ml. Cling film prevents the steam from directly heating up the surface thus helps to form a silky smooth surface. You can use aluminum foil instead of cling film. The time of steaming is only for your reference since it depends on a number of factors. The shape and material of the dish, the quantity and depth of the egg mixture all affect the required timing. 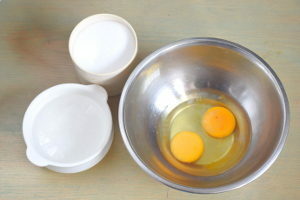 The depth of the egg mixture should be about 2 cm. 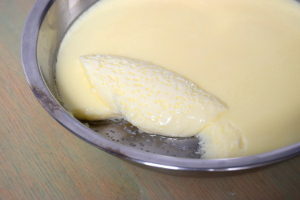 The center of the custard may not fully cook if it is too thick. 16 replies to "Chinese Steamed Eggs- how to get the silky smooth texture"
Quick question. Are you weighing the eggs and water? Why I ask is you are using grams for eggs and ml for water. Yes, I do use the digital weighing scale. If you prefer not to, after you crack the egg, use the egg shell to measure the water you need. Say if you use three eggs, you can add five egg shell full of water. (5 parts water and 3 parts eggs = about water to egg ratio of 1:1.7). Alternatively, get one digital kitchen scale as it is very useful for other kitchen works too. Good morning! I followed your recipe last nite, but took me near 30min to have the steamed egg properly cooked. Then only I realized the eggs used were straight from the fridge at 4 deg Celsius, with room temp around 28 deg. So I wanna ask at what temperature is your eggs and mixture in the recipe above? Thanks! Please use eggs at room temperature if you want to follow the timing in the recipe. I have made a note about this in the recipe (as you can see now). Thanks for pointing out so I can make it clear to the readers. I think all brands are equally good. I am using a brand called Tanita. Very reliable and robust, good for use in my cafe. Noted with thanks. I will certainly reduce the volume of the new videos I produce in future. Excellent post and tips. I especially appreciated the details on how you tested and eliminated one variable at a time. I was already pleased with my current steamed eggs, but with a couple of the tips posted here, my latest steamed eggs were the best! Glad to know my little tips are useful to your steamed eggs. Have a great day ahead and enjoy cooking. I love how you have done your steamegg homework and laid out the details just to make the perfect egg! A combination of cooking with soul and science. Good job! Thank you, Toby. I will definitely develop more recipes in this direction. Hi, so i failed multiple time, and i use water bottle. In my country where i live now the water from tab is undrinkable, so i suppose tab water u mean is the same like bottle water and boiled water is boiled tab water right? Yes. You can use bottled water. Water straight from the tab is drinkable (safe) in some countries but not all. Since the egg custard will not reach 100°C, it is better to use bottled water or use boiled water to make the Chinese steamed eggs.